A visit here offers spectacular views of the Riviera Maya beaches, Caribbean Sea and surrounding coastal region. Tulum holds the honor of being the most picturesque archaeological site in the Riviera Maya and the only one to have been built overlooking the ocean. A visit here offers spectacular views of the Riviera Maya beaches, Caribbean Sea and surrounding coastal region. 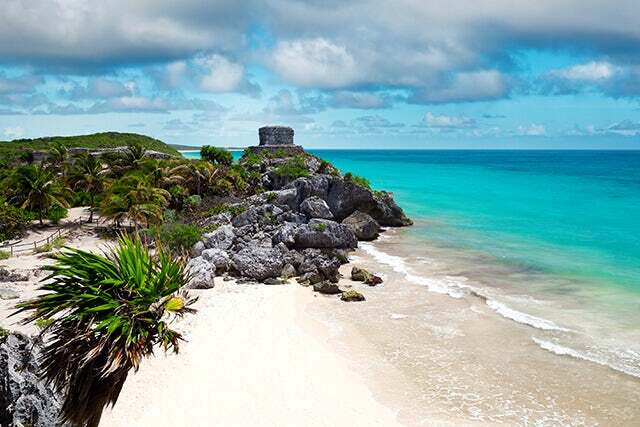 Tulum was an ancient Mayan fortress city that rose to power toward the end of the Classic period. The most iconic of its structures, the Castillo, is perched on the edge of a cliff overlooking the clear turquoise blue waters of the Caribbean. The cliff-top Castillo, with its beachfront location and lush green landscape, is the image most often associated with the Mayan Riviera. You’ve probably seen the postcards. An expansive walkway extends out around the ruins and a staircase nearby leads down to the beach where you can swim and sunbathe. Tulum is one of the few archaeological sites in Mexico where it really does make sense to bring a swimsuit. The best way to experience Tulum is to combine a tour of the ruins with some beach time—maybe even a refreshing dip. Most travelers choose to visit the ruins at Tulum on day trips and organized tours. If you’re traveling independently, you’ll find that mornings are the best and least crowded time to plan your visit. Keep in mind that Tulum is also an enchanting place to spend a few nights, so consider checking into one of the beachfront cabanas or boutique palapa hotels located near the ruins. The coastline along this southern stretch of the Riviera Maya remains relatively undeveloped. It offers a relaxed change of pace from the resort cities to the north and serves as a great base from which to explore more of the region, including the ancient Mayan ruins at nearby Coba.